This past weekend I took my sons out to pursue my halibut quota. I usually don't fish for them this early in the year- finding them can be a little spotty and the weather is still a bit gnarly at times, but I guess the same thing can be said about the fishing and the weather whenever you go out. Anyway, both boys like to long line and since I needed the money I decided to go. In order to get a mor e accurate idea of the process, for anyone who might be reading this and may be unfamiliar with commercial halibut fishing, you need to look at the bottom picture first. It shows the boat under the ice chute at the cold storage dock. The guys are directing the ice into the bins which will be covered with thin foam ice blankets to try to keep it from melting too fast. In order to keep the fish fresh we have to have an ample supply of ice. My fish hold can carry six tons of ice/fish. Of course I've never caught that much fish in one trip, but it would sure be fun to try. The next picture (from the bottom) shows them cutting up some grey cod for bait. We had actually caught this cod fish on this trip using either some frozen squid or salmon. I was fortunate enought to catch enough grey cod, or Pacific cod to rebait my hooks. Halibut like cod fish so it's pretty good bait. Its tough and stays on the hooks well- much better than herring, although it doesn't have the scent that herring has. Still, I would prefer to use it when it's available. In the third picture we're setting hooks. I'm not sure how many I have any more. Every trip you lose some gear. Either they don't get snapped on good when you're setting or they get knocked off the back of the boat or the gangions get chafed on rocks or coral and have to be replaced. I think I have between three and four hundred hooks, which sounds like a lot to someone who may not be in the business, but it's a relatively small number of hooks. I don't really need more right now. The commercial fleet is on a quota that has been reduced by some sixty two percent I believe in the past five years, at a time when the commercial sport charter fleet was exceeding their allowable catch by forty percent or so. Finally, after things got so bad, the government decided to limit the number of charter boats. In Sitka alone there are over four hundred charter boats and in the little town of Gustavus, at the entrance to Glacier Bay there are I don't know how many lodges. 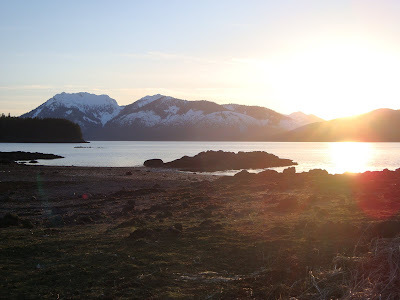 I watched one day as four charter boats from there pulled up to the airplane float in Hoonah last year and unloaded either forty six or fifty six boxes of fish. These are seventy pound waxed fish boxes filled with fillets. It gives a new meaning to "sport fishing". Anyway, hopefully some of the abuses will be dealt with by the new ruling from the National Marine Fisheries Service. Of course like most government agencies, they didn't act until the damage was done. Oh well, better late than never. The top picture shows some of our catch. For several days of fishing we ended up with a net weight of about 681 pounds- a little less than half my quota, so it wasn't great fishing, but it wasn't bad either for this time of year. We were fortunate enough to have a few nice fish too- 161 lbs, 111 lbs, and 91lbs were the largest, so all in all it was a good trip. The best part was being able to spend time with the boys again doing something we all enjoy. This past Sunday Jan and I decided to pry ourselves from the couch and go out to join several of our kids and grandkids for a picnic out at Long Island. The weather was uncommonly warm and sunny that day and it was nice to get out and enjoy the sunshine. 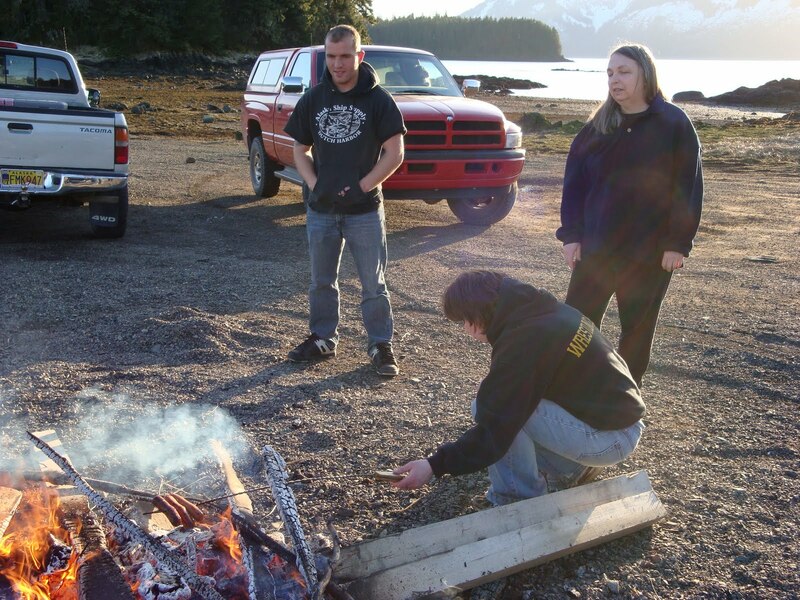 Jennifer and her family are regular visitors to this sand spit and by the time we arrived on the scene, Ben had a fire going and all the food was layed out on a blanket. That's just the way I like it. I show up just in time to eat and have fun and leave before the mess needs to be cleaned up. Jen is the master weenie- roaster today. She wisely chose to purchase a commercial hot dog roasting implement for just such occasions. It has a long steel rod with two spears on the one end and a wooden handle on the other. While it's better than most sticks that I've used, I think it should be more solidly built- perhaps out of stainless steel and another foot longer with an insulated glove built into the handle so you don't have to worry about roasting both your fingers and the weenies at the same time. Several years ago Jen provided us with a great deal of entertainment when she was roastin hot dogs out at False Bay. She was using a stick at the time and the weenie was just about to the point of perfection when the end of the stick burned off and it fell into the fire. Undaunted, she speared another one and proceeded to do the same thing again. Someone finally had pity on her and took over the cooking duties. We had to- there was only two packages of hot dogs and the way she was going we would have had to excavate our meal from the ashes if she was left in charge. In the bottom picture, if you look closely near her knee, you can see the dusty remains of what was supposed to be a picnic delight. She claims that she didn't drop it, but I'm not really convinced. While writing about this picnic I'm reminded of another one a few years back- I think it was on Memorial Day. We went back out to False Bay with Jen's family and the pastor of the Assembly of God church with his family. He had a little white and brown Jack Russell terrier named Izzy, a spastic little thing that had a nasty habit of finding anything disgusting in the yard and rolling in it. It just so happened that the dog had been given a bath prior to going with the family on the picnic. When the pastor opened the car door the dog ran out, found an enormous pile of bear crap and proceeded to roll in it. While that was funny enough on it's own, what really cracked me up was when he exclaimed, "Izzy! Look at you! You've gone and stained yourself!" Then he proceeded to put the dog back in the car. I question the wisdom of that, but I wasn't riding with him so I guess it didn't matter. Anyway, regardless of bear droppings or stinky dogs, burned weenies or bugs, picnics are a lot of fun and I should strive to attend more of them. I dropped down to the harbor yesterday to do a little work on the boat and I was amazed at the number of cockle shells that littered the loading ramp area. On minus tides, like the ones we're experiencing, the mud flats are exposed and the cockles that lay just under the suface are easy prey for the birds. Crows are the only ones I've seen probing the mud. Once they've located and dislodged one of the mollusks, they fly into the air and drop it on the concrete or pavement, thus breaking the shell and exposing the meat inside. Of course they don't bother cleaning up after themselves and it's almost impossible to keep from running over the shells. Several years ago I was pushing one of the two wheeled carts that the harbor keeps for the patrons to use. I wasn't paying too much attention I guess until I heard the familiar crunch of a shell being crushed and heard a Pssssssss as the air when whooshing out of the tire. I can't remember what I was hauling - probably 8D boat batteries or fifty pound cannonballs. In any event, whatever I had was heavy and I had to push it up the steep ramp with one of the two tires flat. I know that it can't always be low tide when I have a massive burden to haul to or from the boat, but it certainly seems like it is. One of two scenarios usually happens; I'm going down the ramp, which is set at a fourty-five degree angle, leaning back as far as I can while grasping the cold steel stucture, trying to keep the cart from plummeting down the ramp and plunging into the drink at the bottom, or -I'm trying to pull a sum of weight that would stress a mule up the incline, all the while fighting gravity and an urge to just give up and let it careen down into the bay. Once in a while there is a good samaritan who, whether out of pity for my plight or fear that they may have to give me CPR and mouth to mouth if I suffer a heart attack on the ramp, will step up and give me a hand. It's not uncommon though for someone to wait patiently at the top of the ramp while you struggle to the summit, red faced and eyes bulging, all the while panting like you were going to deliver a baby any second. It's kind of like being in the Olympics. It really tests your endurance. So far I've been up to the challenge, but I'm thinking that in the near future I may be utilizing the downtown float. You can drive down it and unload your stuff directly onto the boat. It would be a lot easier for everyone involved and would eliminate the fear of a mouth to mouth encounter with a bearded fisherman.